The Oak Manor roof refurbishment work which started back in January is continuing apace. So far, the central three-story section of the building is complete, as is the river-facing wing on the Parterre Place side (i.e. closest to the quiet pool and the footbridge over to the main buildings). They are currently working on the northern river-facing wing (closest to Magnolia Terrace) and that should be completed on 9th May. Then work will move over to the parking lot side of the building, with a currently scheduled completion date of the 18th of July. 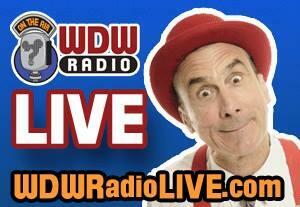 Tune in via your web browsers or mobile devices tonight at 8:30pm (EST) to watch the WDW Radio LIVE show, this month coming to you direct from the River Roost Lounge at Port Orleans Riverside with everyone's favourite entertainer, Ye Haa Bob Jackson. Have a great evening folks! 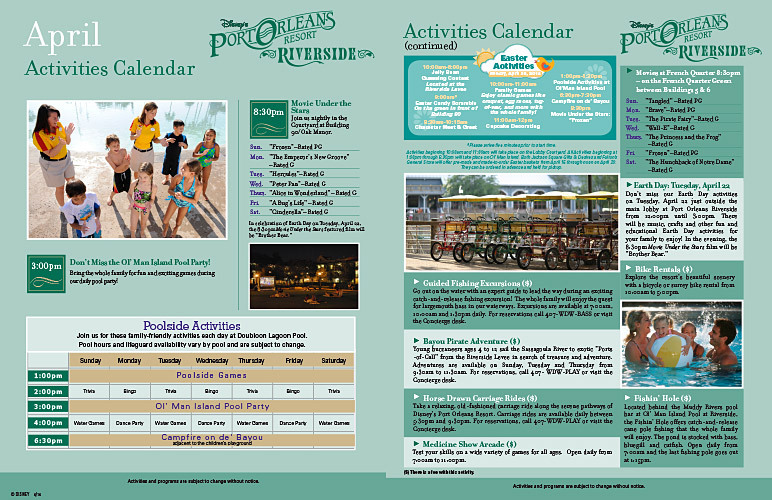 The April 2014 Recreation Activities and Movie Schedules for Port Orleans Riverside and Port Orleans French Quarter are now available. See the main Recreation Activities Schedule page for full-size PDF versions, or click on the images below. The outdoor movies will start at 8:30pm and the daily campfires commence at 6:30pm this month. There will be extra activities on Easter Sunday (20 April) including Character Meet & Greets, Jelly Bean Guessing Contest, Easter Candy Scramble, Cupcake Decorating and Family Games such as croquet, egg races and tug-of-war. 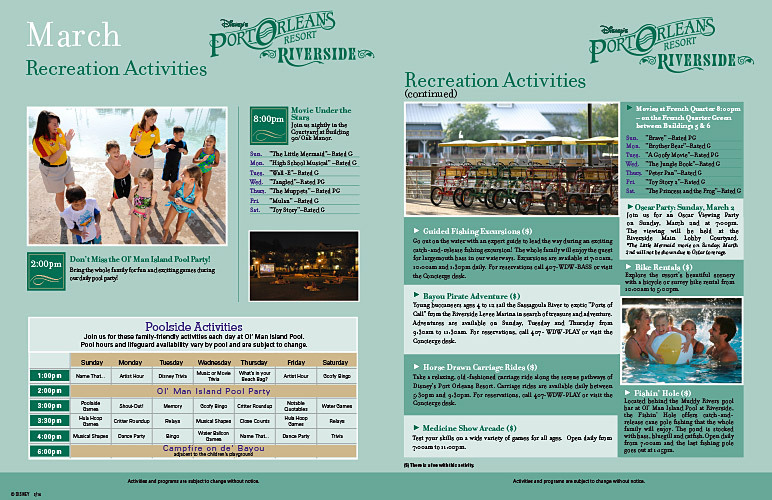 The March 2014 Recreation Activities and Movie Schedules for Port Orleans Riverside and Port Orleans French Quarter are now available. 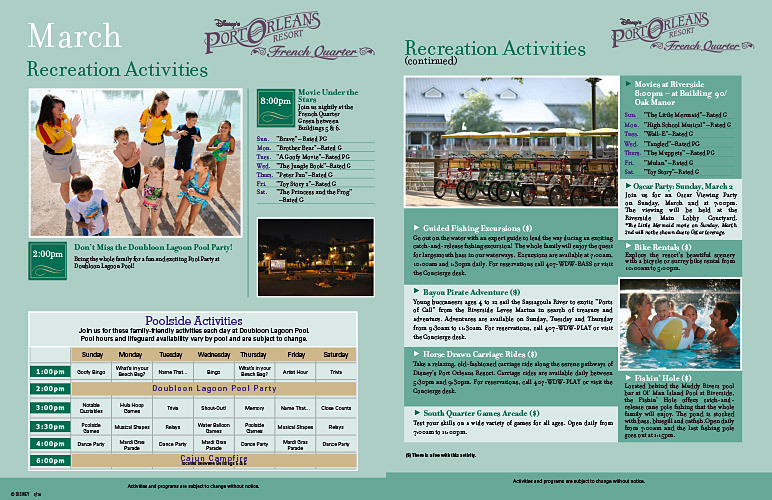 See the main Recreation Activities Schedule page for full-size PDF versions, or click on the images below. The outdoor movies will start at 8pm and the daily campfires commence at 6pm this month. On Sunday 2 March, the Oscars ceremony will be screened live at the Riverside Lobby Courtyard instead of the regular movie. On Tuesday 4 March, Port Orleans will feature its annual Mardi Gras celebrations, including a mini-parade around the resort organised by the cast members - starting at French Quarter at around 1:30pm and getting to Riverside by 2pm. 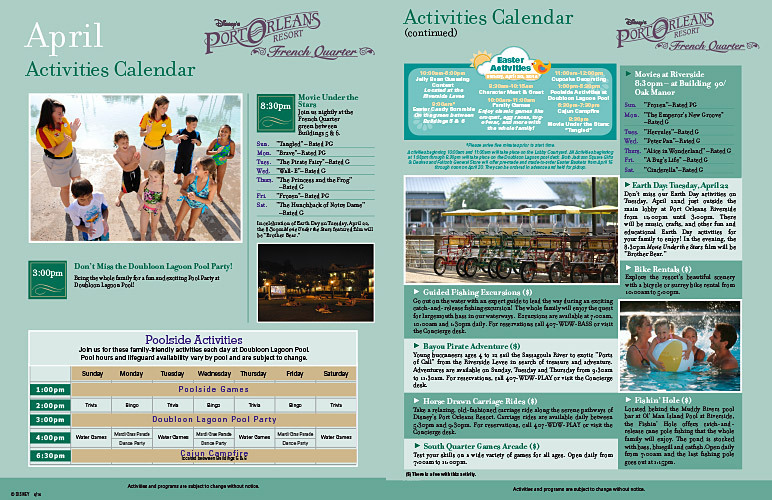 Note: French Quarter's "Doubloon Lagoon" pool will reopen on 4 March after its seven-week refurbishment. 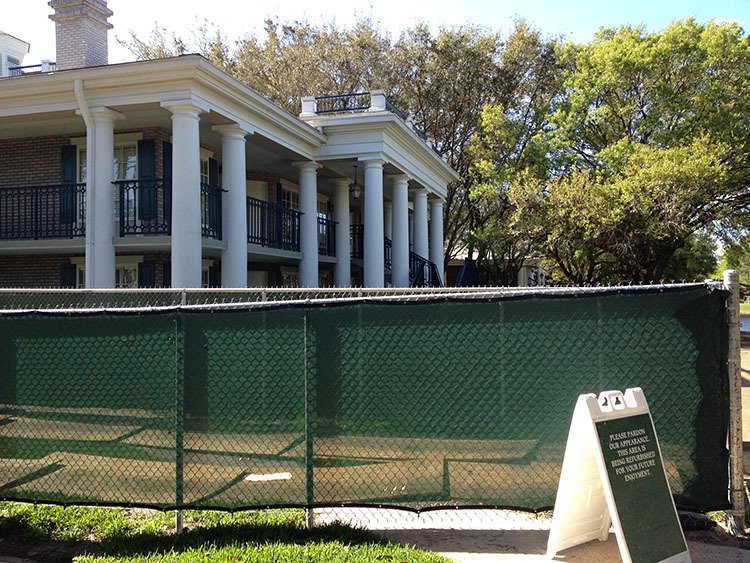 Also, in what appears to be a massively short-sighted and very disappointing move, as from 2 March 2014 Disney has seen fit to permanently close the Port Orleans Riverside Levee boat rental facility. Very Bad Show, Disney - you are meant to be all about "plussing" your parks and resorts, not "minussing" them. If you wish to make your views known, ask for an explanation, or request that this decision be reversed, please contact wdw.guest.communications@disneyworld.com. Well this one came out of the blue... the Riverside Levee boat rental marina will be permanently closing as from Sunday 2 March. Very Bad Show, Disney - you are meant to be all about "plussing" your parks and resorts, not "minussing" them. The Sassagoula river ferry will continue to operate to and from Downtown Disney as normal, as will the children's pirate cruises and the cycle rentals, but no more Sea Raycers, kayaks or other boat rentals. As far as I know at the moment, this will be a permanent closure. Apparently this will happen at the other Moderates too. And so another bit of magic is chipped away. Please email wdw.guest.communications@disneyworld.com if you want to make your views known, and perhaps ask for a proper explanation. Update 2 March: I contacted my friend Denise from mousesteps.com and she and her partner Jeff took a trip over to Riverside yesterday and rented out a pontoon boat for an hour-and-a-half and took one last nostalgic trip along the Sassagoula before the service finally closed last night. Her report and photos can be found HERE, and Jeff's video of the trip on YouTube HERE. So sad to see this wonderful facility go away. Update 4 March: I've heard mutterings that this might be something to do with an external (third-party) contractor who ran the rental service. To be honest, I'd always assumed it was run by Disney directly (certainly the staffing was provided by Disney cast members) but I've never really had the need to look into it. According to website WDW News Today, the facility was not popular enough at the Moderate resorts and so the company has pulled out, leaving just the Deluxe Resort locations operating. I'm guessing the current closure of the DTD rental dock for the Disney Springs project won't have helped either.